The Weimaraner is a loyal companion hunter. Above Wellie sits patiently awaiting his opportunity to retrieve a downed duck. Below he has the duck ready to deliver to hand. To the left, Boomer brings in the chucker to Cliff. 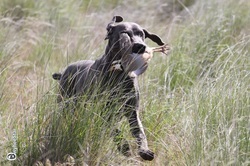 Pheasants, doves, quail, and the elusive chucker are all candidates for the Weimar retrieve. The Weimaraner is all about teamwork. Willingness to work for you is key to success. The Weimaraner works to please those they serve. OwyheeStar Weimaraners frequent hunt tests, where evaluation (and proving their hunt-potential) is primary to the process. Cliff has participated in three varied hunt venues. NAVHDA and VHDF events are not the typical competition. Every participating versatile hunting dog can earn a prize or points. NAVHDA awards prizes based on a points system. VHDF awards points. * Sponsored buy the local Britanny and German Shorthaired Pointer Clubs. The vast majority of folks (and their Weimaraners) will never participate in a hunt test. Most go about the business of hunting (sometimes traveling long distances), but often taking advantage of local opportunities. For the most part, the Weimaraner is a family dog, that hunts when the opportunity presents. This doesn't mean they don't need trained. They do! Nevertheless, they are versatile hunters, that make great family members. 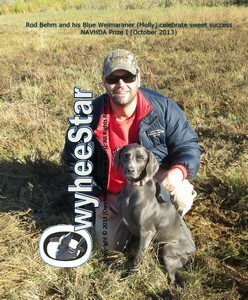 If you have a question regarding hunting with the Weimaraner, hunt tests, etc., please Email Cliff.